Antagonists interact with receptors, but unlike agonists, have no intrinsic activity. Thus, the drug-receptor complex does not produce a biological response. However, since antagonists occupy the receptor, they will inhibit the interaction between the agonist and the receptor according to the principles of mass action, resulting in an inhibition of the agonist-induced pharmacological response. Endogenous compounds such as hormones, neurotransmitters and autacoids are agonists and elicit a response by activating receptors. Therefore, specific antagonists of those receptors are able to inhibit a variety of physiological and pathological processes in which endogenous compounds are involved as agonists. 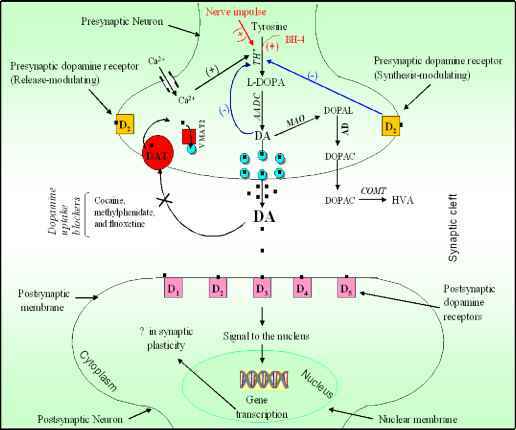 Pharmacologic antagonists can either interact with the receptor reversibly or irreversibly depending on their rate of dissociation from the receptor. The inhibitory effects of reversible competitive antagonists can be overcome by increasing agonist concentration. This type of blockade is also referred as surmountable. Thus, the dose-response curve for an agonist in the presence of a reversible antagonist is shifted to the right, but there is no change in the maximum response. The Kd value, the equilibrium dissociation constant for an antagonist, can be determined by evaluating the response of the agonist, D, in the absence and in the presence of the antagonist [68,69]. If the response produced by the agonist in the presence of a competitive antagonist, I, is the same as that produced in the absence of the antagonist, then the fraction of receptors occupied by the agonist ([DR]/Rt) under both conditions should be the equal. Therefore, the equation for the proportion of receptors occupied by the agonist alone should equal that for the proportion of receptors occupied by the agonist in the presence of the antagonist. The ratio of the agonist concentrations in the presence and absence of antagonist (inhibitor or blocker) that will produce equivalent responses is termed the dose-ratio. This equation relates the dose-ratio to the KD and the concentration of inhibitor. The dose-ratio for the agonist depends on the concentration of antagonist and the affinity of the antagonist. It does not depend upon the size of the agonist-induced response. The dose-ratio is evaluated graphically to determine the KD of the antagonist. The equation for calculation of KD is presented below. 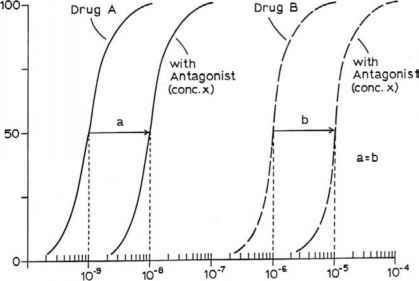 To determine the dose-ratio, concentration-effect curves for the agonist are plotted against different concentrations of the competitive antagonist. As the concentration of the competitive antagonist is increased, the agonist-response curves will exhibit a parallel shift to the right with no change in the maximum response. From these agonist-response curves, the dose ratios at EC50 of the agonist can be determined (Refer to the figure 7). Figure. 7. The concentration-effect curves of two drugs A & B of different potencies are presented. Percent Effect is on vertical axis. In the presence of antagonist, the curve of each agonist is shifted to an equal extent i.e., the dose-ratio (r) = ED50 with blocker/ ED50 control, are equal or (a=b). Equal ratios generally indicate that both agonists act on a single type of receptor [69,70]. Figure reproduced from Patil  with permission credits to Indian Journal of Experimental Biology of the National Institute of Science, Communication and Information Resources (CSIR), India. Figure 8. 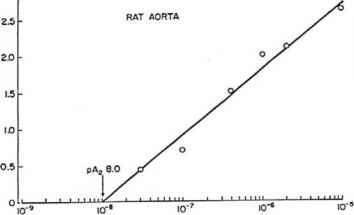 Schild plot for the antagonistic effects of phentolamine on a receptors of rat aorta. The agonist used was norepinephrine. The Y axis is log (DR - 1). X axis shows the concentration of the competitive antagonist, phentolamine. Note that the plot produces a straight line with a slope of 1. The X intercept is called the pA2 and is equal to -log KD , Figure from Patil et al. with permission from Elsevier. A Schild plot (Figure 8) refers to the regression line generated by graphing log (DR-1) on the Y axis against log concentration of antagonist on the X axis. This plot gives a straight line with a slope of 1. When the dose ratio is 2, then DR -1 = 1, and the log of 1 = 0. The X intercept is log KD which is the equilibrium dissociation constant of the competitive antagonist. The term pA2, which has been used to describe the potency of a competitive antagonist, is the negative logarithm of the molar concentration of antagonist that produces a dose ratio (D]j/[D]) of 2. Thus, pA2 = -log KB, KB or KD represents the affinity of the blocker for the receptor and is expressed in molarity units. It is independent of the agonist being used and the size of the response. If two agonists act on the same type of receptor, a fixed concentration of an antagonist will antagonize the response of both agonists to the same extent, producing the same KB. Antagonists are useful for characterization of the receptor activated by the agonists. Similarities in the chemical structures of agonists do not mean that a single type of receptor is activated. The receptor type can be characterized by the KB values of the competitive blocker against agonists. In contrast to a competitive reversible antagonist, an irreversible antagonist tightly binds to the receptor usually by covalent bonding and dissociates very slowly, if at all, from the receptor. A nonequilibrium type of block is produced. Consequently, the receptor is occupied by the inhibitor, and the inhibition cannot be overcome by increasing the concentration of agonist. In other words, the blocking action is unsurmountable. As mentioned above, under conditions in which the response of an agonist is limited by the number of receptors, an irreversible antagonist will decrease the slope and the maximum response of the agonist-response curve. However, when spare receptors are present, the irreversible antagonist can inhibit the response of the agonist, which is reflected by a shift in the agonist-response curve to the right without decreasing the maximum response. In this case, although there is a decline in the number of receptors, there are still sufficient receptors available to produce a maximum response. The maximum response produced by a partial agonist, however, may be easily reduced by the irreversible inhibitor. This is because partial agonists have lower efficacies than full agonists and, therefore, must occupy a higher fraction of receptors to produce the same response as a full agonist. Consequently, for a partial agonist there is less receptor reserve. Receptors can be protected from inactivation by irreversible antagonists by administering a competitive antagonist or an agonist prior to the exposure of the tissue to the irreversible antagonist. The competitive antagonist and the agonist will compete for the receptor sites and prevent the irreversible antagonist from interacting with these receptors. It can be difficult in the laboratory to distinguish between a competitive reversible antagonist and an irreversible antagonist on the basis of their duration of action. A lipid soluble competitive antagonist may be retained by the tissue for a prolonged period, resulting in long term receptor antagonism. For example, the P-receptor antagonism produced by the competitive antagonist, propranolol, may have a long duration of action, giving propranolol the appearance of pseudo-irreversibly blockade of P - adrenoceptors. Reversible noncompetitive antagonists inhibit the agonist induced response by acting at a site that is separate from the receptor. This site may be one of the steps in the sequence of events that occurs after receptor activation. Alternatively, the site affected may allosterically cause agonist binding inhibition. Noncompetitive antagonists would be expected to produce effects that are similar graphically to irreversible antagonists, e.g. a decrease in the slope and the maximum response of the agonist-response curve. Therefore, the time-course of recovery of the sensitivity of the tissue to the agonists after the antagonists have washed out must be determined.